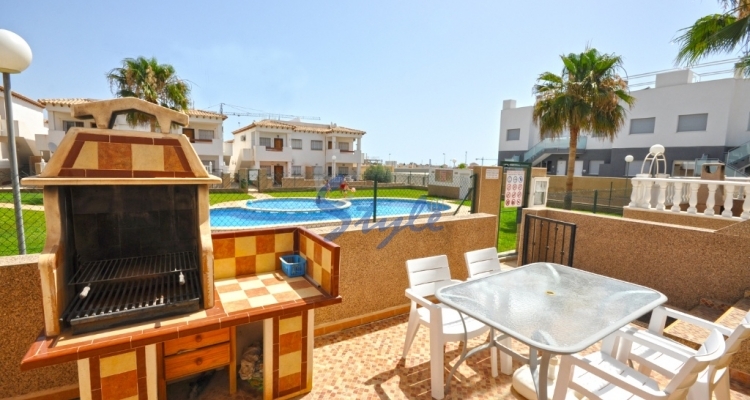 If you are interested in buying quality property on the Costa Blanca at the best price, take a look at this bargain apartment overlooking the community pool with green area in a gated complex. The property has outside patio with barbecue, large glazed terrace, living room, separate kitchen with very large utility/storage room, 2 double bedrooms and 1 bathroom. This property is located in the popular area of Punta Prima, Orihuela Costa on the southern Costa Blanca just a few minutes away from the sandy beaches, a great variety of bars and restaurants, bank offices, gym and commercial centres. Here you will find everything that you need not only for a holiday but also for permanent living. The international airport of Alicante is just a 40 minutes drive while the Murcia airport is a 25 minutes drive. The apartment comes with air conditioning, electric heating and is to be sold fully furnished. It also has an allocated parking space underground. This is a great opportunity to buy your own Costa Blanca property in a wonderful location for only 89.990€!